Pop punkers Everyone and Anyone answered our Band of the Day questions and their answers covered everything and anything and anyone and… you get the idea. Gary: We all played in other bands and drank in the same bars, similar to how The Avengers assembled. Rob: Gary and I started the band a few years back as a songwriting project and it’s grown from there. We’ve had a few line up changes and slight sound changes to get things exactly where we want them to be over the years and now I think we’re sounding exactly how we want to on our new record. So we’ve been playing together for a while but only in the last 9 months or so I’d say we really came into our own. Gary: This could end up in court so I’m just gonna go with what Rob says. Rob: Too right! Yeah, there’s a few different ways people remember it but as I recall somebody said “Everyone and Anyone” in a totally unrelated conversation and we were like “Yo, that’d make a dope band name”. Scott: Mine is kind of a mixture between Deaf Havana and Jack White. The White Stripes have been my absolute favourite band for years and years; I just love the simplicity of it all. As for Deaf Havana I remember being introduced to them while in college and it was like a whole new thing to me. The lyrics I could just massively relate to. They’ve changed their sound quite a bit over the years but James, the singer, manages to impress every time with his lyrics. Gary: I will have to say New Found Glory, They are hands down one of the bands that made me wanna play live music and write songs. Matt: I think I would describe our music melodically as a “classic” pop punk vibe. What I feel that separates us subtly from the other bands in the scene at the moment is how we deliver that sound. We kind of take a more “edgy” approach to the music and it can almost be described as having undertones of aggression against a backdrop of positivity. Rob’s vocals and lyrics are a good example of this as his style leans towards a more punky delivery than clean pitch perfect vocals and this really works for us as it sounds different to the other bands around us at the moment. This kind of transcends to the other instruments in the band, too with the guitars having a lot of syncopated attack on them whilst maintaining that important melody and the bass taking on a distorted aggressive tone. Rob: When writing the lyrics, I look to take influence from things that have either happened to me or things that I’ve seen happen to other people around me. The good and the bad stuff that happens to us all at one point or another and I always aim to put a positive outlook on them whether that’s moving past something, growing up etc. Gary: The live show is like a Lady Gaga show without a budget. Rob: It’s always a party. I enjoy crowd surfing on giant pizza slices which is about as pop punk as it can get. A guy also rode a giant inflatable toucan over the crowd at our last show which was nice. Scott: Honestly I couldn’t remember how many shows we’ve played, it must be touching 100 surely? Matt: You’ll have to come to show to find out! I suppose we approach our live shows with the same energy and enthusiasm we have for creating the music in the first place. This is our passion and we like to think that this shows when we are out there performing live. We want to make sure that every person who comes out to see us has good time. As a band its hard to keep track of how many shows we’ve played in total since we started. Over the past couple of years we’ve been really fortunate to play top gigs opening for the likes of Reel Big Fish on the Fireball Tour and bands like WSTR and Creeper. Rob: Somebody getting a line of people sat on the ground at one of our shows rowing in time to the song takes the gold for me. 100% coulda made the Olympics with that that team. Gary: I lost my phone crowdsurfing at a Seaway show and the singer got it back for me. That was pretty crazy. Gary: I like to keep my live set up as simple as I can to minimise set up times so I just use an Orange Dual Terror head into a Orange 2×12 cab. I use a TC Electronic PolyTune and sometimes a boss noise gate depending on the guitar. For guitar, it’s a single Humbucker single volume knob Strat loaded with a Seymour Duncan Invader and a set of Ernie Ball skinny top heavy bottom I think the gauge is 10 – 52. Scott: Currently I’m using a Fender Telecaster through an Orange Dark Terror. I also have, as the boys like to put it, a spaceship on the floor. Currently it’s in pieces trying to swap and change pedals but mostly I use a Strymon Timeline and an Ibanez Tube screamer and of course a trusty TC Electronics Polytune. Matt: My main bass for E&A is a Fender Mexican precision with Dimarzio P bass pickups which drives that dirty aggressive sound. In terms of live sound I keep it simple using a SansAmp DI straight in to the PA system. I have an Orange Crush 100 for onstage sound but its the SansAmp that does all the work. Rob: Ya boi has an SM58 microphone that I take on the road with me. I go hard at shows and I’m forever accidentally splitting my lip open on my mic so it’d be pretty gross to bleed on someone else’s mic. 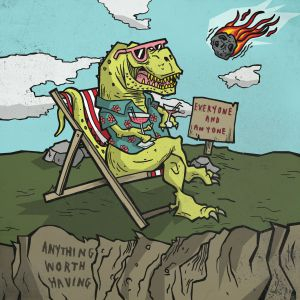 Scott: Our new EP Anything Worth Having has just dropped, you should all go and check it out! We’ve still got a few more shows booked for this month as well you can catch us at Jacaranda, Liverpool Sept 29th and Jimmy’s Manchester September 30th. Matt: We have also released the single “Rainy Days” from this EP and a music video to go with it which can be found on YouTube and through the band’s social media. We are particularly proud of what we have achieved with the new EP and want to get it out there as far and as wide as possible. It was crazy that the EP was released on the 14th September 2018 and on the 13th of September we had a message from a guy in Australia who had already downloaded and listened to it with the time zone difference. Rob: We’re gonna do as much touring as possible to see out the rest of the year and we have some awesome dates already booked in to announce. There’s a few other little surprise we’ve got on the way too but that might be more early 2019. Gary: And we plan to work on more music I know we’ve only just put out the new record but I like to always look towards the next step. Gary: I’m gonna say New Found Glory or Neck Deep for headliner. As for opening there is a sick band called Evander that I think people should check out. Rob: Playing with Blink or Fall Out Boy would be a dream come true. I’d love to have our boys in This Time Last Year there too, they’re a sick live band and great dudes. Matt: We’ve met loads of sick bands on our travels and its really difficult to single out one band to add to this gig but I would have to say Lyon Estates. For everyone who hasn’t listened to them I urge you to go and check them out right now. They’re easily one of the best pop punk bands in UK right now as well as being some of the nicest and most genuine people we’ve ever met. From previous Band of the Day, Drifter: what’s your greatest accomplishment outside music? Matt: I have a daughter who is 5 years old and my total world. I am one of those parents who just talks about their child all the time because I am so insanely proud of her. She’s also a big fan of the band and often asks me to put songs on in the car for her. Scott: Well, I’ve recently become a father and it’s hard to top that honestly. It’s one of the greatest feelings and he’s already got his E&A merch ready. I know the boys have already hired him as permanent merch guy for us. Rob: I was gonna say my certificate for swimming one length of the swimming pool in primary school but it kinda pales in comparison to both of those. Gary: I chugged a large McDonalds milkshake and didn’t die of brain freeze. I felt pretty happy with myself after that. From The Night Suns: If you could go back in time, and stop a band from existing, who would it be? Rob: It’s pretty hard to argue with that. And from N.E.S.H. : At a local level, what do you think can be done to help the music industry and bands of the future? Rob: I think the more that bands can support each other the better. We’ve made some ace friends on the road and we all help each other out whenever we can and that really helps. Scott: More venues and promoters that are accessible for smaller bands, the ones giving out supports slots to locals are sick! Rob: Yeah, we’ve had some great opening slots thanks to guys like Reckless Promotions so more people like them would be ideal.